Summary Atom D525 powered dual-drive, dual Ethernet NAS with USB 3.0 port and ultra-flexible backup options. 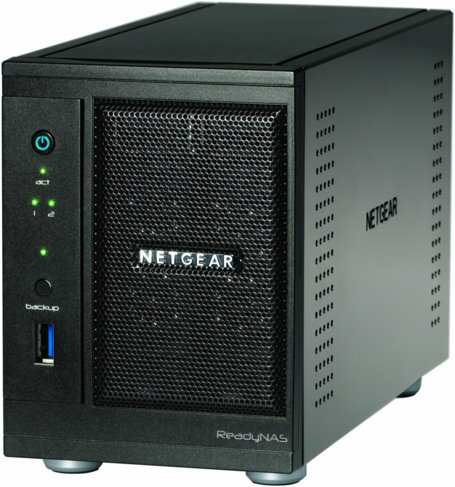 The ReadyNAS Pro 2 may look like the old ReadyNAS Duo, but it's a completly different beast. The Pro 2 is gussied up with a speedy new hardware platform based on a dual-core Intel 1.8 GHz D525 Atom with 1 GB of RAM. The old Duo, which is still sold, uses Infrant's IT3107 CPU and has only 256 MB of RAM. This new hardware platform finally breaks NETGEAR's insistence that USB 2 and network backup options are good enough and includes one front-mounted USB 3.0 port. That USB 3.0 port must be mighty expensive, though, since the two USB ports on the rear are still only USB 2.0. The new Pro 2 also sports dual Gigabit Ethernet ports that support failover and aggregation and can also be used to connect to two different networks. The old Duo has only one Gigabit port. You can't really see that much from the photos below. But by peering between the metalwork, I could spy the heatsinked Atom D525, Intel CG82NM10 NM10 Express chipset, NEC D720200F USB 3.0 controller, Samsung K9F1G08U0C 1 GB flash and two Marvell 88E8057 Yukon Ultra II Gigabit Ethernet controllers. The 1 GB of memory comes on an SoDIMM, which you can replace / upgrade without voiding warranty, but at your own risk. The other device visible on this side is an SM321QF, which I think is more flash. NETGEAR is positioning the Pro 2 as a business-class product and has equipped it with enterprise-class Seagate Constellation ES drives. My test sample came with two 1 TB (ST31000524NS) drives loaded, which resulted in a 32 W power draw with the drives spun up and 17 W with them spun down. NETGEAR's battle with fan noise on the ReadyNASes seems to finally be over—I could hear only drive noise when the drives were running and no fan noise whatsoever, even while running performance tests. Those enterprise-class drives, however, are pretty noisy and you will hear them in a quiet home office setting. The Pro 2 ran RAIDiator 4.2.16 firmware. Among the more notable changes, this version adds support for 3 TB drives, RAID volume expansion when using "Flex-RAID" (that's ReadyNAS-ese for standard RAID), IPv6 support (CIFS and FTP only) and a new Add-ons menu. This last feature finally allows you to see installed add-ons and browse and install other add-ons directly in the ReadyNAS admin interface. This feature looks like a work in progress, since the only two add-ons shown in the Available menu are Egnyte Office Local Cloud and ReadyNAS Replicate. I hope to soon get around to doing an article summarizing RAIDiator's extensive feature set, similar to the ones I did for QNAP and Synology. But, like any other review, they get out of date quickly, as new features are added in new software versions. In the meantime, here's the spec page from the Pro 2's datasheet.